On a test flight over Maryland last week, the Pentagon's F-35 jet fighter landed vertically for the first time  like a helicopter  as it was vaunted to do. But at just about the same time, its price tag was climbing in the other direction. A Swiss Army knife of the skies, it's designed for vertical takeoff and landing to please the Marines and their smaller ships, while more conventional versions are slated to satisfy the demands of the Air Force and Navy. All of a sudden, however, the F-35 is in big trouble. On Wednesday, Defense Secretary Robert Gates told Congress that its recent cost and schedule snafus were "unacceptable." And while the Pentagon is not about to kill the program, the rush to push the plane down the assembly line and into the skies highlights the nation's continuing inability to pit its limited resources against real threats. While the nation was preoccupied waging two wars, the F-35 was lurking in the background, devouring dollars like there was no tomorrow. New data suggest that the program  the most costly in Pentagon history after the even more expensive F-22 fighter, which Gates killed  has been out of control. "Affordability," declared an internal Pentagon report critical of the F-35, "is no longer embraced as a core pillar." A too-ambitious design lashed to a too-ambitious schedule has driven up costs so fast and so high that even the Pentagon  long practiced at ignoring such mismanagement  couldn't stand it any longer. It's a strange predicament for the modest jet that was supposed to be the cheap end of the military's high-low warplane mix of F-22s and F-35s. The Pentagon launched the F-35 Lightning II program a month after 9/11. Over the past eight years, the price-per-plane has doubled  from $69 million to as much as $135 million  even as none of the 2,443 on-order planes have been delivered. The program's cost has soared from $197 billion to as much as $329 billion. Plans to profit from prospective sales of more than 700 of the single-engine, single-seat fighters to eight allied nations are beginning to look like wishful thinking. "In response to what I consider to be unacceptable delays and cost overruns over the past year, this department has taken a number of steps to fundamentally restructure this program," Gates told a House panel on Wednesday. "I have replaced the [F-35] program manager ... while withholding more than $600 million ... from the lead contractor"  that would be Lockheed Martin, the nation's biggest defense firm, the same company that built the F-22. Just last summer, Gates toured the huge Fort Worth, Texas, factory where the F-35 is coming to life and declared himself satisfied. "My impression is that most of the high-risk elements associated with this developmental program are largely behind us," he said. Cheaper F-35s rolling off the assembly line seemed to bolster the wisdom of Gates' earlier decision to kill the F-22 fighter, because cheaper F-35s could fill any resulting gap. Unfortunately, that was last year's logic. Gates said on Wednesday that Pentagon officials had bamboozled him with "overly rosy forecasts" that were more thorn than flower. After burrowing into the F-35's cost and schedule, President Obama's Pentagon team  including Bush Administration holdover Gates  recently discovered deep-rooted problems. "Things are more complicated than people imagined they were going to be," Ashton Carter, the Pentagon's top weapons buyer, told reporters earlier this month. "You can't control costs, you can't control schedule if you're being unrealistic about costs and schedule." The rush to build the F-35 has led to ever-changing blueprints, which has led to slowdowns on the production line, which has delayed flight testing. How bad is it? Last year, engineers expected to churn out 200 changes  a month!  to the F-35's design, but actually generated about 500. Even after Gates' restructuring, taxpayers could spend close to $60 billion on more than 300 F-35s before flight testing is finished, meaning costly modifications will be required. "There was a lot of concurrency built in," Air Force Secretary Michael Donley recently acknowledged, using the military's buzzword for the way the Pentagon builds weapons at the same time it drafts blueprints for them (just like the way you order work on your kitchen addition to begin when the architect is only halfway through her drawings). Carter has conceded that the overlap of design and manufacture on the F-35 is "unprecedented" and  even after Gates' latest changes  "worrying." Yet even as lawmakers were fretting on Wednesday that the F-35's troubles spelled risk to U.S. security, Gates urged them to keep cool. He said he had expanded the development period by an additional 13 months and thrown in nearly $3 billion more for the testing program (which completed only 16 of 168 flights slated for 2009). He also slowed production of the plane. Gates insisted that while the program's management had been poor, its technology was sound. "It will become," he said, "the backbone of U.S. air combat for the next generation." But perhaps it is the strategic thinking underlying U.S. military spending that is the problem. Under current plans, the U.S. military will have 1,000 more warplanes than any other nation by 2020, as Gates himself told the House panel. When it comes to the most modern category of fighters, in 10 years the U.S. is expected to have 20 times more than the Chinese, and 15 times more than the Russians. And that doesn't include the punch provided by the Pentagon's fast-growing fleet of armed drones. In a perversion of postCold War thinking, the $1 trillion push to build and fly the F-35 isn't driven by huge fleets of hot new warplanes being built by  well, new perpetual bogeyman China or former perpetual bogeyman Russia. Rather, the haste is being driven by Pentagon concerns over looming shortages of F-16 and F-18 jet fighters. And what's causing those shortages? 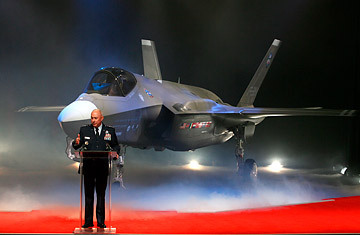 Gates made it clear that the current planes must be retired in order to save money so the military can pay for the F-35. "The Air Force, in order to be able to afford the modernization, is going to have to retire some older aircraft," he said. "That's just a fact of life." Others in the Pentagon call it a self-licking ice cream cone: the U.S is now in an arms race with itself.